This stylish aerodynamic machine features a 60TON carbon frame with SEI film, as well as the jewel in Shimano's crown, a Dura Ace 9100 drivetrain. Topped with Mavic Ksyrium Pro Exalith wheelset, this Zero7 Dura Ace Road Bike is ready to race. The Zero7 Dura Ace Road Bike features the lightest road bike frame that Wilier has ever created. The ultra-light carbon fibre frame weighs just 799 grams. Equipped with integrated cables, an integrated fork, and supreme aerodynamic efficiency, the evolution of the Zero7 Road Bike will help you climb onto the podium. New construction techniques have allowed Wilier to produce a new frame design and reduce the volume of the frame tubes by 19%. A unique thermoplastic material is included to help to create uniform and equal pressure along the inner carbon walls of the Zero7 frame. This helps to create a stiff structure that's ready for raw power. The plate through which the rear brake cable enters the top tube has been redesigned to permit passage of electronic wires if running an electronic group. This 2-in-1 plate is minimal, almost negligible in weight, and cleanly integrated into the frame. The same applies to the shifter cables (the front and rear derailleur in the mechanical version), which enter through a tiny plate on the downtube. The special internal design of this plate perfectly guides the cables inside the downtube, minimising friction and keeping the cables tense and perfectly straight up to the point where they cross over in the plate positioned underneath the bottom bracket. The shifter cables cross over outside of the frame on a cable guide plate, making it impossible to direct them the wrong way. When using an electronic group, the plate on the downtube is replaced by a blind plate, giving the frame a cleaner, more elegant look. The shape of the cable routing plate under the bottom bracket is specially designed to cross over the shifter cables with minimum friction and provide the perfect cable angle for the function of either shifter cable. We made sure that the rear derailleur cable is kept suspended inside the chainstays without touching its walls. In the derailleur however, it allows the cable to reach the attachment point to the derailleur at a natural angle. The cable guide plate is flush within the frame, which provides a smooth aerodynamic surface. This improves air flow over models using a traditional plate. To achieve greater riding stability and aerodynamic efficiency, Wilier’s technicians have focused their attention and research on the front end of the frame. They found that by repositioning the downtube and the top tube with respect to the headtube, the headtube’s height virtually increases. The resulting virtual increase increases torsional stiffness by 14% over the same size frame in the previous version of the Zero7. With this new configuration, the down tube seamlessly integrates with the crown of the fork and generates an aerodynamic profile that reduces drag. 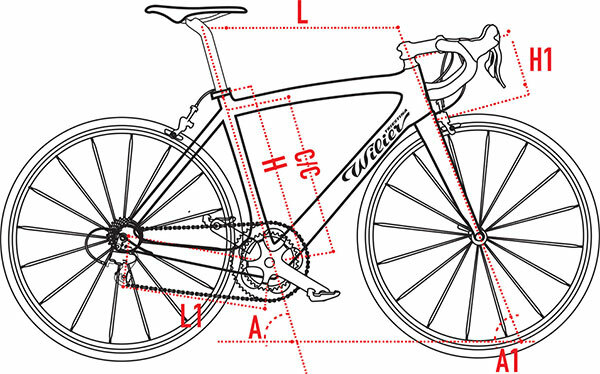 The fork’s legs boast the same aerodynamic features as the TwinBlade and Cento1AIR models. The fork’s brake hole is hidden by the downtube which keeps it clean and well protected. The resulting new design also gives the front end improved aesthetics with simple, harmonious lines. The BB386EVO system takes the construction concept of oversized central movement successfully introduced by Wilier in 2009 to new limits. They came up with an innovative way of obtaining unprecedented stiffness at a critical point in the frame, perfectly incorporating a stiff crankset into a stiff frame. The traditional BB30 was inadequate as it required a 68mm frame in the frameset: too small for the degree of stiffness they wanted. On the basis of this assumption, they worked with FSA to come up with the new standard BB386EVO, which uses a 30mm axel crank with a longer axle and a greater circumference in the BB shell of the frame. BB386EVO gives the Zero7’s frame much greater stiffness in the bottom bracket area than an ordinary BB30 frame. The problem of tolerances is solved by the press fit system: bearings are integrated with a polymer cup which adapts perfectly to different diameters and can be secured inside the frame’s 46mm opening. The BB386EVO is compatible with various other conventional standards on the market. We subjected the BB386EVO to independent testing at an authoritative German research institute. They found the frame to have the stiffest bottom bracket of any frame they have ever tested. Looking back at this result, Wilier can confidently say that framesets built using this technology are among the most highest performing on the market. No joints, glue or screws: rear dropouts form a single unit with the lower part of the rear triangle. The joining section, usually constructed in aluminium, is also part of the carbon monocoque unit. All of this means gr eater lightness and stiffness. Wilier looks to every detail on their bikes to optimise performance and functionality, and their 3D Derailleur Hanger is evidence of this. Zero7 derailleur hangers are no longer merely there to facilitate the installation of the rear derailleur. They have assumed a third dimension of functionality, seamlessly integrating different systems while simultaneously serving as cable stops. For the new 3D Hangers, Wilier dramatically increased stiffness to ensure perfect shifting and improved durability. The new 2-in-1 derailleur hangers can be used with either mechanical or electronic groups. With a mechanical groupset, the cable stop is positioned closer to the derailleur itself. This enables a shorter length of housing from frame to derailleur, while still allowing for optimal cable arc-maximising rear derailleur smoothness and consistency. As with the Zero7’s internal cable routing through the downtube, this cable stop keeps the rear derailleur shift cable well-tensioned and centred within the stay for a silent and frictionless shift action. When using electronic groups, the design allows the electric wiring to pass through in the cleanest way possible. The internal electric routing is optimised as well, with the wiring’s point of exit positioned well above the dropout for quick and unencumbered wheel changes.